Ever feel stuck for ideas on how to use your First Edition dies for cards and DIY projects? Don’t fear! Maxine is going to show you how to use the delicate First Edition Nesting Doily dies for three beautiful makes including this super handy notebook! 1. Die cut the largest die from the First Edition Nesting Doily dies on to various Dovecraft Blooming Lovely 8x8 paper designs. 2. Change the blade on your Dovecraft Trimmer so it can perforate your paper. 3. Place the top of each die cut doily into the Dovecraft trimmer to make a perforation line across the top. TIP – Allow enough room so you can add tape to the top of each piece of paper, to adhere the sheets together. 4. Add a small piece of Dovecraft Perma Fix tape above the perforation line on each die cut and adhere each doily together to create a cute notepad. This note pad is perfect for writing down what you need at the shop or important tasks to do throughout the week. The perforated line makes it so easy for you to write and rip without destroying the notepad, lovely! Maxine has also created the sweetest card design featuring a die cut doily in the centre! She has then decorated the card with pretty embellishments found within the Blooming Lovely collection. You could also create a fabric jar lid for your smaller bits and bobs with just one Doily die cut! Paired with a length of ribbon, this adorable jar will make a wonderful gift or addition to your craft desk. 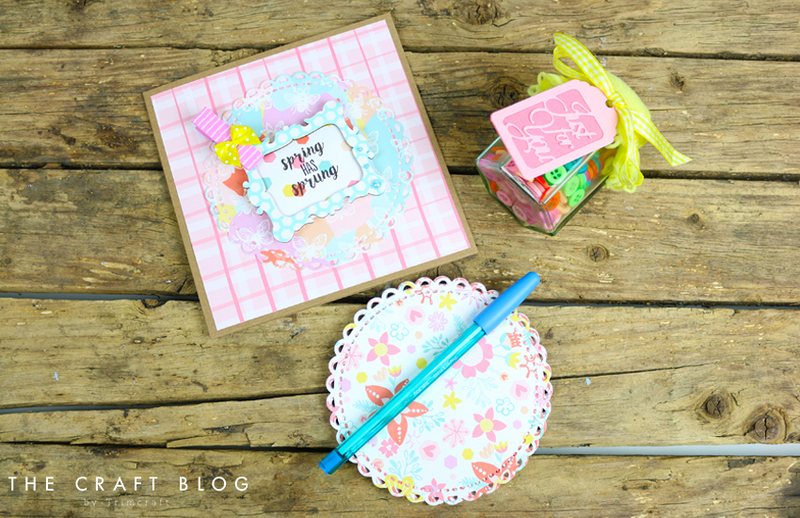 How will you use First Edition Nesting Doily dies? We would love to see so don’t forget to #trimcraft when uploading to social media and to share your die cut makes in the inspiration area! I have loved using the doily dies. They're very useful for a huge range of projects. Nice doily dies, pretty projects Kathy.